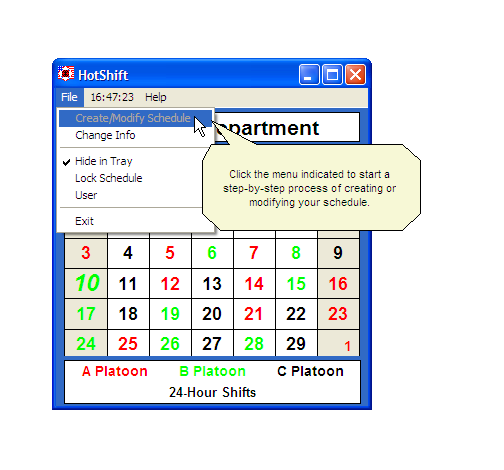 HotShift Free is a simple calendar which can display which group is on-duty for any given 24-hour shift. Each day is color coded to indicate the group on-duty. HotShift Free will only work for 24-hour shifts like the schedules used by fire departments. The exception is 48 hour shifts as in 48 hours on and 96 hours off. A 48-hour shifts is really just 2 consecutive 24-hour shifts, so in fact any multiple of 24-hour days will work. It does not need to connect to the internet except for online help or email support. You can easily create your own schedule using any colors you choose to represent the groups on-duty. The program will refer to the work groups as platoons but you may call them anything you like. The platoons are easy to configure, Always use the actual platoon count even if you only want to display your own platoon only. To display only one platoon, enter a space for the code and a color different than your platoon color for each of the other platoons. The next step is to select the cycle length or the number of days in the rotation. This is critical! The program will not calculate the schedule correctly if this number is wrong. If you cannot enter the days on duty and get all of them to match your schedule, then this number is wrong. Now you can synchronize the platoons to the calendar days. Use the Calendar form and the Platoon On Duty form to sychronize the schedule. Select a day in the calendar and select a platoon in the On Duty form. Warning! Do not set a User Name and Password until you have thoroughly checked out your schedule and used the calendar. The Lock Schedule option can be used without a password, just click OK. Setting a User Name and Password raises the possibility that you could lock yourself out of being able to modify the schedule if you forget the Login.